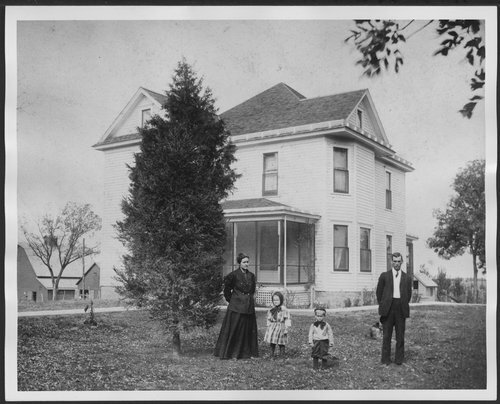 This black and white photograph shows the John Sutherin family in front of their home at 3716 West 6th in Topeka, Kansas, at the turn of the century. The Menninger Foundation purchased the home in 1946, remodeled it for the Northwest Office building for the Topeka Institute of Psychoanalysis, and occupied it in 1947. In 1925, the Menninger Sanitarium Corporation purchased a farmhouse on the west edge of Topeka, Kansas. The farmhouse became the inpatient clinic and the surrounding 20 acres were developed with buildings and gardens to become the "East Campus" of the Menninger Foundation. This building was an nearby farmhouse also purchased and remodeled as offices for the Topeka Institute of Psychoanalysis, an important addition in the Menninger philosophy of treatment. In 1982, the "West Campus", a much larger area, was developed west of Topeka. In 2003, the Menninger Foundation was moved to Houston, Texas. This black and white photograph shows the John Sutherin family in front of their home at 3716 West 6th in Topeka, Kansas, at the turn of the century. The Menninger Foundation purchased the home in 1946, remodeled it for the Northwest Office building for the Topeka Institute of Psychoanalysis, and occupied it in 1947. In 1925, the Menninger Sanitarium Corporation purchased a farmhouse on the west edge of Topeka, Kansas. The farmhouse became the inpatient clinic and the surrounding 20 acres were developed with buildings and gardens to become the "East Campus" of the Menninger Foundation. This building was an nearby farmhouse also purchased and remodeled as offices for the Topeka Institute of Psychoanalysis, an important addition in the Menninger philosophy of treatment. In 1982, the "West Campus", a much larger area, was developed west of Topeka. In 2003, the Menninger Foundation was moved to Houston, Texas.